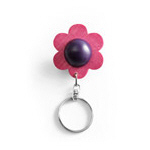 Help save time searching for your keys with one of these bold flower keyrings. 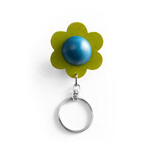 Kukka flower keyrings are a quick and easy way to brighten your keys and your mood. Beautifully crafted from sustainable wood, these designer accessories for her are light to carry, durable and eco-friendly. By instantly individualising your keys, they help save you time hunting for them. Available in three colour combinations, this brightly coloured and eye-catching keyring design will help you to spot and identify your house or car keys. The distinct flower-shaped fob could also make it quicker for you to find by touch and fish your keys out of your pocket or handbag (especially if over-sized or over-filled). Choose mixed red for warm feminine style, mixed blue for a cool summery look, or green and blue for a fresh earthy feel. Bold, bright and natural, these flower-shaped keyrings embody the spirit of summer. 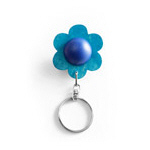 Priced under £10, these flower keyrings are good value for money. Buy one now for yourself to brighten those days in the office or as a fun and practical gift for a female friend or relative.